I've always loved engagement rings with emerald cuts--and way before Brad gave Angelina that gorgeous emerald cut diamond engagement ring. The geometric, elongated shape of an emerald cut has an innate streamlined elegance. Emerald cut diamonds are part of the family of fancy cuts and, while they are very popular with brides, as you'll see here in this gallery of new emerald cut engagement rings, there are also some striking bridal rings with this linear cut, which aren't diamonds. FROM MEGAN THORNE . . .
Megan Thorne 18K gold "Picture Frame" engagement ring with emerald cut center diamond. This is Megan Thorne's picture-perfect "Picture Frame" engagement ring in 18K yellow gold with an emerald-cut diamond center stone; bezel-set accent diamonds flank each side. Goshwara 18K rose gold engagement ring. Goshwara 18K rose gold ring with rock crystal and diamonds. From the Goshwara "Gossip Collection," this ring features an emerald cut rock crystal center stone that, at approximately 0.90 tcw., is nearly a full carat. Bezel-set in 18K rose gold, a halo of white diamonds surrounds the stone, then extends halfway down the split shank--0.80 tcw., which is a lot of diamond accent! FROM CLAUDIA ENDLER DESIGNS . . .
Claudia Endler Designs modern engagement ring with a bezel-set 1-1/2-carat emerald cut diamond. Such architectural style, right? Showcased in a bezel setting, the one-and-a-half-carat diamond is the focus of a beautiful modern ring from Claudia Endler Designs. Here, it's in 18K white gold, but you can also order it in platinum--though, you need to allow two to three weeks for the design company to make it for you. 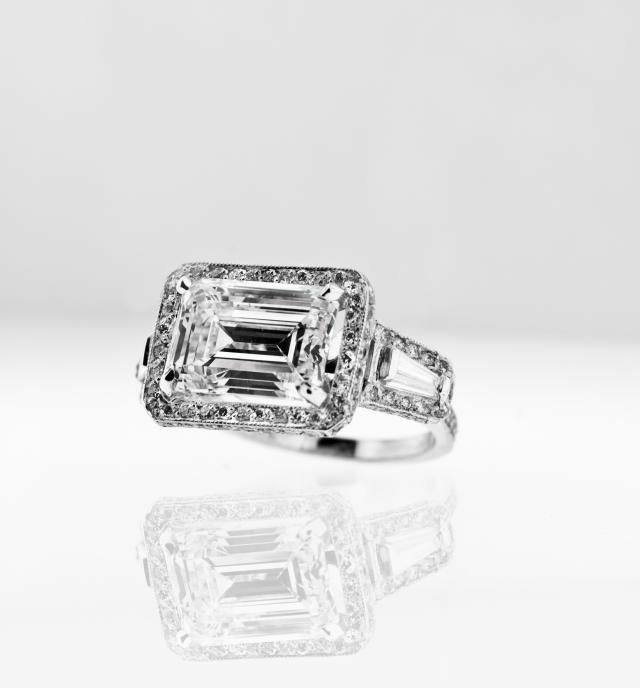 Ana Katarina engagement ring in 18K white gold with 4.23-carat emerald cut diamonds. This is called the "Prima Donna" ring by designer, Anna Katarina--and, with a 4.23-carat emerald cut diamonds, you can see why! It's surrounded by 1.76 tcw in diamonds. FROM BELADORA . . . If you're looking for an emerald cut gemstone ring, chances are that Beladora may have it--they carry antique, vintage, and estate pieces from all eras, e.g., Art Deco, Edwardian, etc., This particular Beladora platinum engagement ring--estimated to be a mid-century design from around 1955-- features a 1.16-carat emerald cut diamond center stone, flanked by baguette cuts on either side, totally 0.40 carats of side diamonds. FROM REINSTEIN/ROSS GOLDSMITHS . . .
Reinstein/Ross Goldsmiths 20K peach gold engagement ring with emerald cut diamond. This is quite the special wedding design from Reinstein/Ross Goldsmiths, as it's hand-fabricated in a custom alloy of 20K peach gold, The ribbon-like detail on the precious metal is a subtle alternative to the artisinal brand's many signature braided styles. FROM TAKAYAS CUSTOM JEWELRY . . .
Takayas Custom Jewelry 18K white gold diamond engagement ring. Adding additional sparkle to this one-carat emerald cut engagement ring from Takayas Custom Jewelry, another 0.40 carats of accent diamonds go halfway down the 18K white gold shank. FROM TACORI . . .
Tacori platinum and diamond engagement ring from the "Dantela Collection.". Such a cool style from the Tacori "Dantela Collection." Here, in platinum, the hand-set pave diamonds on the ring spotlight the emerald-cut center diamond; Delicate milligrain detail decorates the crisscrossing ceiling of the ring's high-polished band. FROM CHRISTOPHER DESIGNS . . .
Christopher Designs engagement ring with Crisscut (R) Emerald diamond center. While a basic emerald cut diamond has 46 facets, here, in this Christopher Designs' engagement ring, which features the brand's premium Crisscut (R) Emerald, the gem has 77 facets for even greater brilliance. It's surrounded by rounds. FROM DAWES DESIGN . . . .
Dawes Design 18K yellow gold diamond engagement ring and wedding band. A prong-set emerald cut diamond is the highlight of this unique 18K gold engagement ring by Jennifer Dawes of Dawes Design. Wedding band in 18K gold fits snugly against the ring, allowing the showstopping emerald cut to "drip" deliciously over it! Takayas Custom Jewelry 18K white gold diamond engagement ring with 5-carat-plus emerald cut diamond. Okay, yes, this is a dazzler--from Takayas Custom Jewelry, The 18K white gold design features a 5.65-carat emerald cut center diamond, and it has approximately two more carats of baguette diamonds. Megan Thorne 18K gold "Mosaic" pave engagement ring. Here, from Megan Thorne, is her "Mosaic" pave engagement ring in 18K yellow gold with emerald cut diamond center.